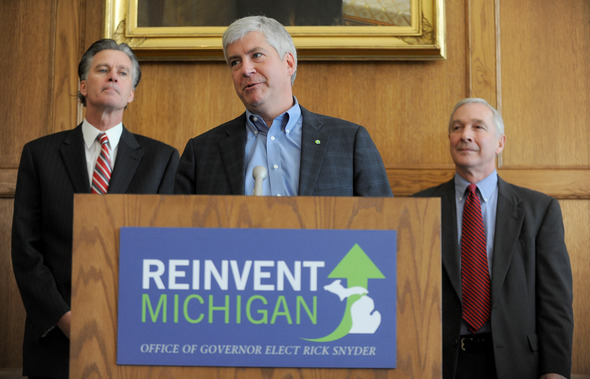 Though he was swept into office in the same class as Scott Walker, John Kasich and Rick Scott, Michigan Governor Rick Snyder has set himself apart in a couple of important ways. While his Republican contemporaries were eschewing money for high-speed rail, Snyder welcomed the funds. Just last week, his state received an additional badly needed $200 million cash infusion. Now, once again, Rick Snyder is displaying a level of pragmatism — and frankly, vision — that recalls a less acrimonious political era, at least with respect to transportation. Earlier this spring, Snyder issued a directive to state agencies on the importance of “placemaking” in economic development. The document — one in a series of statements that lays out his administration’s priorities — puts forward a plan for state agencies to cooperate to build a more livable, less car-dependent state, with strong urban centers. Snyder’s directive seems to take a page directly from Basile’s recommendations. It calls on 10 state agencies, including MDOT and the state’s economic development agency, to collaborate and innovate with an eye toward making Michigan more livable. Although the document makes no direct reference to transportation reform, it stresses the importance of healthy cities. That might seem like a fairly obvious position for a state where, outside of the Detroit MSA, there are more deer than people. But it’s hard to imagine Scott Walker or John Kasich expressing the same commitment to Milwaukee or Cleveland. In a show of contrasting ideological positions within the same party: just last week, the Kasich Administration announced plans to de-prioritize rail and transit projects in Ohio, in favor of projects that “impact economic development,” presumably highways. Meanwhile, it speaks volumes of the difference in perspective that the Michigan Department of Transportation houses its bike and pedestrian programs under the Department of Economic Development. Gary Heidel, director of the Michigan State Housing Development Authority, says Snyder recognizes the connection between having livable communities and a strong economy. He should, Heidel says — Snyder came from a background in economic development. A former venture capitalist that once headed computer-manufacturer Gateway Inc., Snyder has also served as head of the Michigan Economic Development Corporation. In addition, he was also the founder of Ann Arbor Spark, a nonprofit economic development group that seeks to build the regional economy around the town that is home to the University of Michigan. Snyder’s commitment to placemaking didn’t happen in a vacuum. MDOT’s Economic Development Administrator Mike Kapp said it is part of a larger “cultural change” taking place in America’s capital of cars. Michigan’s notorious economic troubles, particularly in the most recent recession, have had a key role in inspiring reexamination of the state’s complicated relationship with cars. MDOT’s main livability tool is Complete Streets. Michigan has statewide legislation that gives funding priority to local communities that have Complete Streets policies. That has helped make them one of the leading states in the nation in terms of local policies, says Kapp. John Lindenmayer, co-chair of the Michigan Complete Streets Coalition, called the governor’s directive “encouraging.” But he added that he’s eager to see whether a financial commitment to the concept will follow. He noted that the Michigan House and Senate budgets don’t align with the governor’s stated priorities. Earlier this spring, Snyder issued a directive to state agencies on the importance of “placemaking” in economic development. The document — one in a series of statements that lays out his administration’s priorities — puts forward a plan for state agencies to cooperate to build a more livable, less car-dependent state, with strong urban centers. Hilarious. He just cut state support for cities by $100 million, with more cuts promised next year.